Olga´s main form of artistic expression is painting using acrylics, oils and mixed media. A common theme in her artworks is nature. Olga finds inspiration in the intricate designs, beautiful colors and vibrant moods that can be found in the world around us. 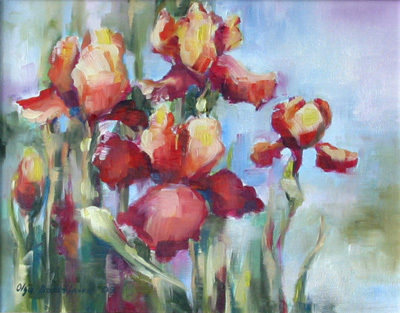 These factors influence her landscape and floral paintings. Her love for nature and the world around us she brings to her local art classes in Richmond Hill . Olga recognizes that the life of an artist is a continual learning experience. She is focused on progressing with her own artistic education by experimenting with a range of different approaches, materials and styles.